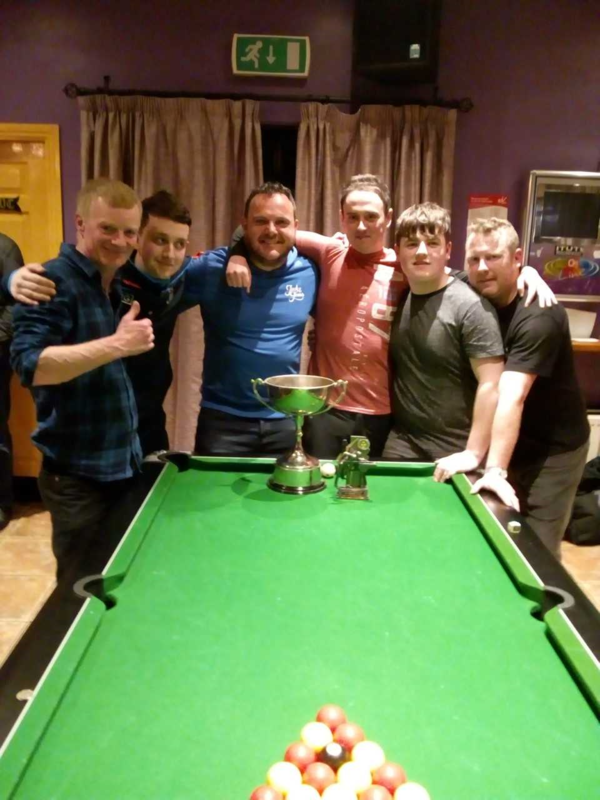 The first leg of the cup between The Leitrim Inn and Cartys took place in The Inn the first night. This was always going to be a close game as most previous encounters resulted in one point wins for either team. The same two teams contested the final last year, with The Inn coming out on top in a very close encounter 16-14. So would The Inn do the double or would Cartys get revenge for last years defeat. The first set Cartys dominated winning 4-1. The Inn rallied back winning the 3 doubles to level it 4-4. Onto the last set and both teams had wins through Gavin Donnelly and Hughie Kielty leaving it 5-5. At this stage it looked like a 7-6 to either team but Cartys pushed on winning the last 3 through John Casey John McKenna and David Flynn. So Cartys held a 8-5 lead to bring back to their pub for 2nd leg. Onto the 2nd Leg and The Leitrim Inn made their way to Cartys trailing 8-5. This was going to be an uphill struggle as The Inn needed a 8-5 to tie the final or better to win it. The Inn got the perfect start winning the first set 5-0 with wins for Prince Regan, Darragh McQuaid, Qisin OConnor, Hugh Kielty and Virgil Lynch. This left the score 10-8 overall. Onto the doubles and The Inn extended their lead winning the first doubles leading 11-8, but Cartys pulled back the last 2 games to leave it 11-10. With only one game separating the teams going into the last set, it was going to be a thriller end to the match and both teams didn’t disappoint. The Inn won the first 2 games to bring them to the hill and lead 13-10. They only needed one more frame to win. But Cartys don’t get to two consecutive finals without showing their class and Gavin Donnelly started the comeback with an excellent dish under pressure. Brendan Shivnan followed up with another win to leave it 13-12. 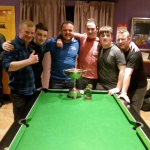 Up last was David Flynn and Prince Regan, if Prince won The Inn lifted the cup and Flynn needed to win to earn Cartys a draw. In a nail biting game that had the big crowd present enthralled, it was Prince that potted a great black and won it for The Inn. John Casey thanked for the sporting behaviour of both teams and the quality of pool played. He presented the man of the match award to Hughie Kielty who played outstanding throughout the final. David Carty presented the Carty Cup to Leitrim Inn captain Darragh McQuaid. Huge thanks to Liam Shanley for reffing both legs of final and doing a super job.